Hi. You like buying stuff, right? Yeah. I bet you do. Heck. We all get ourselves a little sumthin’ special on payday from time to time. Maybe there’s a bauble that catches your eye or a birthday present that needs buying. What’s more American than shopping? Which is why when you need to scratch that itch from now on you should use that fancy pants Amazon link over on the sidebar and kick a little our way. No, it won’t cost you anything but every little bit we get will get us that much closer to full funding the brewery. You win; we win. Are we suggesting you buy something ridiculous ? Well… that’s up to you. No fuss, no muss and we get a little coin. Everybody wins. Beer and bread have always been related. In many ways, they are similar substances. Both take grains and yeast, and use fermentation to create a filling foodstuff. It is only fitting then that we close the circle, and make our dough using beer instead of water. Let’s take a look at making pizza, the Nickel City Brewing way. When you substitute water for beer, you add a richness of flavor to the dough. The kind of beer you use will make a difference in taste that’s subtle, yet worthwhile. As a rule of thumb, the darker the beer, the more taste is imparted. For our pizza dough, let’s use our Hailstorm Ale, our main session beer. It has cascade hops and a rich flavor from the chocolate malt. It’s a light and drinkable beer with a medium brown color….just perfect for pizza. Now, pour yourself a pint of beer. It’s about two cups worth, so you’ll have some left over. The key to any dough is to give the yeast a chance to grow and replicate. This is the magic process which makes bread rise, and beer ferment. Yeast, however, needs a proper environment. 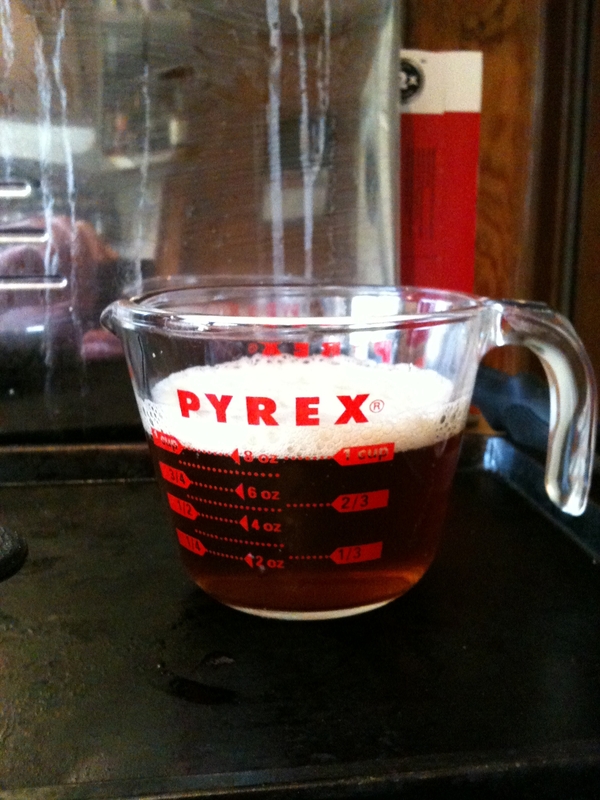 Pour a cup of beer into a measuring cup. It’s too cold right now, so let it get to room temperature. Enjoy the rest of the beer. Let’s get the rest of the ingredients together and then pour yourself another one. You deserve it. Here’s what we’re going to need. When the beer gets to room temperature, toss in 2 ½ teaspoons of yeast. Cover it up, and let it sit for a half hour. This gives the yeast a chance to work it’s magic and replicate. Half hour? That’s a chance to pour yourself another beer. Now combine the ingredients, pour in the beer and yeast, and beat until the dough becomes stiff. If you have a bread machine, let that do all the work. No matter how you do it, you’ve made your dough. Let the dough sit for about an hour. It’ll double in volume, thanks to the yeast going gangbusters. Is it a good time for another beer? Why not! Preheat the oven to 350 or so. 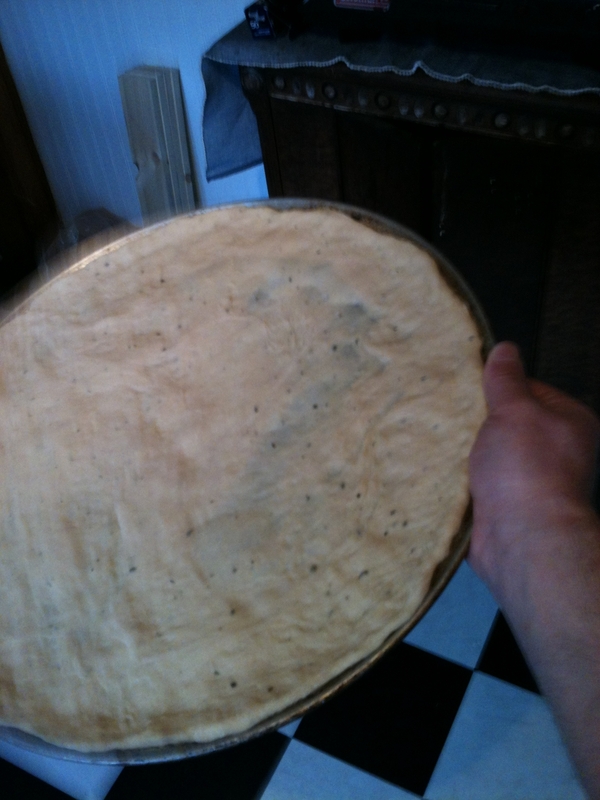 If you have a pizza stone, and why wouldn’t you? let it heat up. Once the dough is ready, drag her out upon a surface sprinkled with flour. 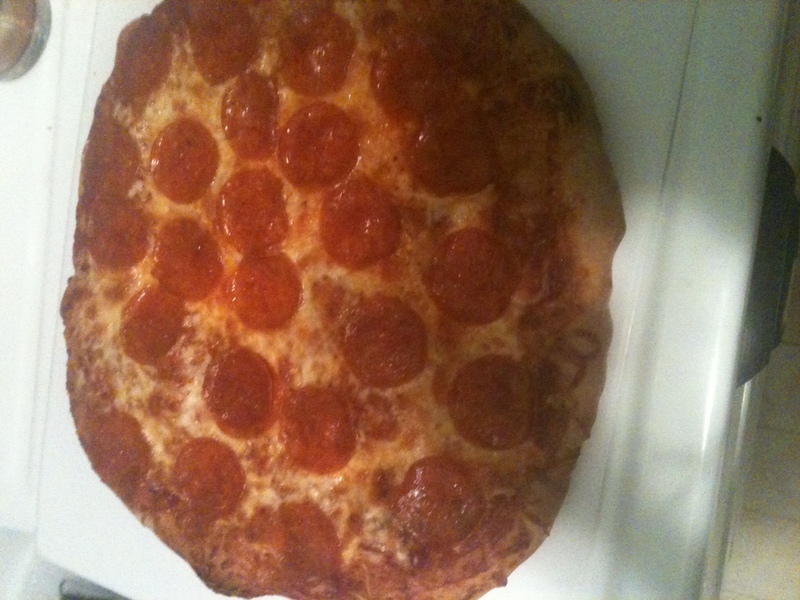 Roll is out into desired pizza shape. The stickier the dough is, the more flour you’re going to want to use. Toss the dough. Play with it. Make your pizza. Notice the smell? You can smell the beer inside. Give it a taste. It’s going to be delicious. Cook until the crust turns a golden color. Now pour yourself yet another beer, and enjoy it with a great pizza. All homebrewers can relate to this. Before you sits your beer, happily finished with its magic process of fermentation. The beer sits there in the carboy, waiting only for some carbonation, crying out to be bottled and drunk. Yet the will to bottle is weak. The idea of spending two hours prepping bottles, cleaning tools, meticulously filling each bottle of beer, capping the bottles and praying that no infection sets in is daunting. You have better things to do. So the beer sits another week. And then another. Finally, it occurs to the homebrewer “perhaps there’s a better way” and so the path to kegging bear is made clear. Now, don’t get us wrong. Bottled beer is cool. It’s neat being able to bring a six pack over to your friends house to share. 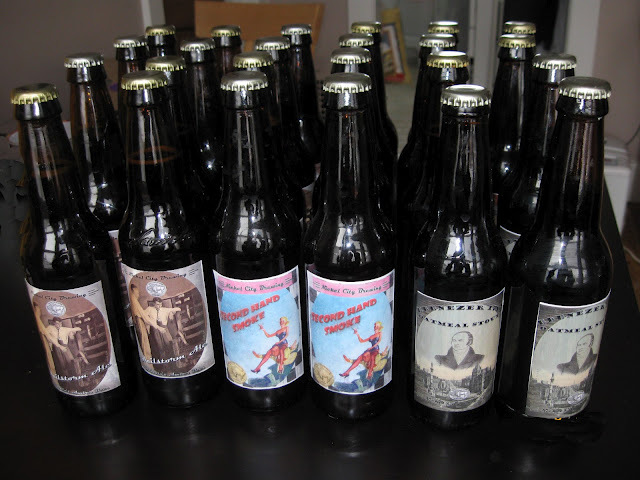 As you can see by the Nickel City beer labels, it doesn’t take much to make the presentation shine. The problem is that bottling 5 gallons of beer just isn’t much fun. Brewing is a labor of love. Bottling is just a labor. Years ago Nickel City faced the same conundrum. Of course kegs are simple, but aren’t they expensive? We started brewing beer because we were too cheap to buy it. Homebrewers are notorious cheapskates. We fight over every purchase, from a glass carboy to a fifty cent piece of tubing. How could we justify that kind of expense? Gentlemen and ladies, you and only you may judge what your time is worth, but I ask you. How much would somebody have to pay for for a day of bottling their beer? You would soon see the true expense of time that you spend getting that beer into those brown bottles. We are only on this earth for a limited time. Those hours you spend bottling will never be returned to you. 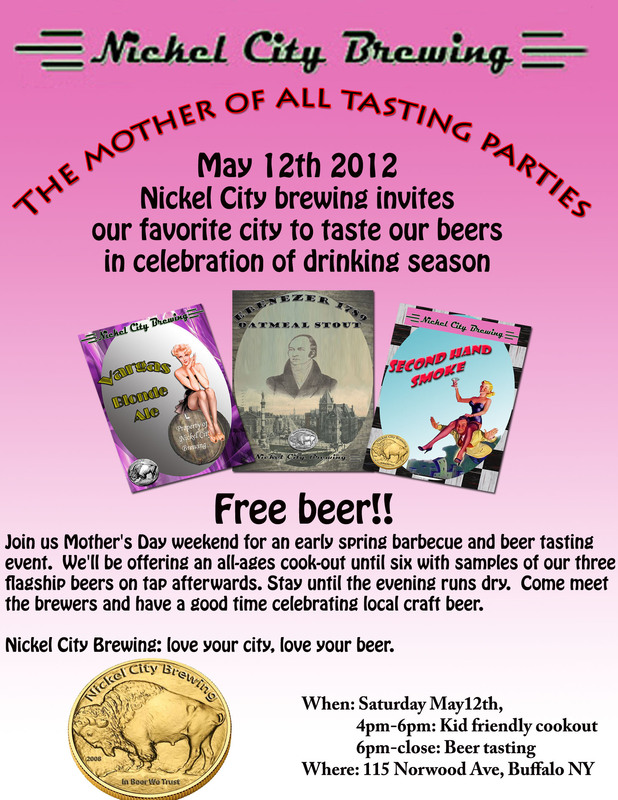 Nickel City Brewing got lucky in those early days. While searching craigslist for miscellaneous brewing supplies we stumbled upon an offer too good to be true. A homebrewer, who when forced to chose between his wife and his hobby made the wrong choice, was offering to sell all his equipment. Equipment that included 4 kegs. 4 kegs. A CO2 tank. A regulator. Almost all one needs to start kegging. Over the next few weeks we’ll talk a little bit about what you need to make your system work….and it’s not as tough as you might think. So all of a sudden, the sad, lonely beer sitting in those carboys that sat neglected had a home. After buying a few pieces of new tubing, we sunk the siphon in the carboy, put the other end in the keg (making sure that both vessels we’re covered with tin foil to prevent infection!) and walked away. That was it. No measuring of priming sugar. No individual filling of 49 bottles of beer, and capping them. No sterilization and cleaning of bottles. 3 days later we were pouring frothy beer into pitchers, and drinking to a new stage of homebrewing. Victory never tasted so sweet. Yes, cheapskate homebrewers, the money is well spent. Next: we discuss the nitty gritty of kegging. That’s right. Beer. 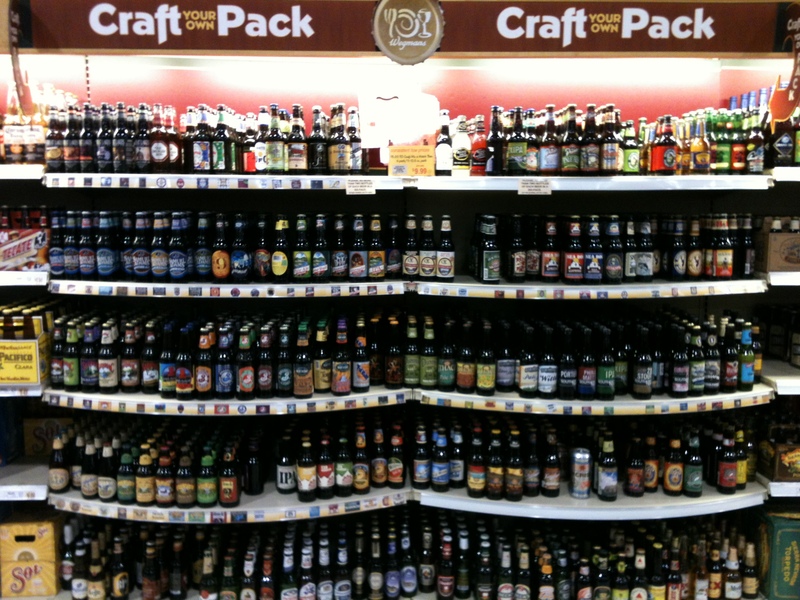 And even after all the reasons why Alec Baldwin’s mom is correct, Wegmans goes and just flat outdoes every other supermarket* with a killer beer section. Bread, milk, eggs and a six pack mixer of Lagunitas Censored, Ommegang’s Rare Vos and Three Philosophers, Southern Tier IPA, Sam Adams Cream Stout and a Harpoon Cider. Wegman’s back wall of beer is nothing new as they’ve offered their crazy expanded selection for a couple years now, but it sure is a luxury that deserves not to be taken for granted. And as I stood there drooling over my selections and anticipating a delicious evening (delicious by necessity to compensate for the lately woeful Sabres), I was approached by an interested gentleman looking for advice. Setting down his twelve pack of InBev produced light American lager, he reached for an empty six pack holder and I’m happy to say he took to each of my suggestions. Two minutes later, I saw him off with a six pack of all Western New York beers, including Flying Bison, Ellicottville Brewing, Southern Tier and Ommegang selections. Even if it isn’t our beer. Yet. * I’m not forgetting Consumer’s or the awesome Village Beer Merchant and you shouldn’t either. peat n: 1. A highly organic material found in marshy or damp regions, composed of partially decayed vegetable matter: it is cut up and dried for use as fuel. 2. such vegetable matter used as fertilizer or fuel. And today we’re using barley that’s been smoked over peat as a crucial ingredient in our Second Hand Smoke, a smooth English Brown ale with a hint of smokey evil. Some of our favorite Scotch whiskys such as Laphroaig and Lagavulin have very strong peat flavors and aromas. The best decription I’ve read describes the flavor as “it tasted like cancer and reminded me of being at the hospital when I was 6 getting my broken leg casted. Nothing positive.” Accurate, if foreboding. The Second Hand Smoke is only 4% peat malt, just enough to give it some of that distinctive character but not enough to overpower the uninitiated. Today we’re brewing a 10 gallon batch which, judging by the fact that it was the first keg kicked at our last tasting party, is sure to not be enough. Have you tried this beer? If so leave us a comment and tell us what you think. If not, maybe you’ll be around for the next tasting party and can give us your opinion first hand of one of our flagship brews.